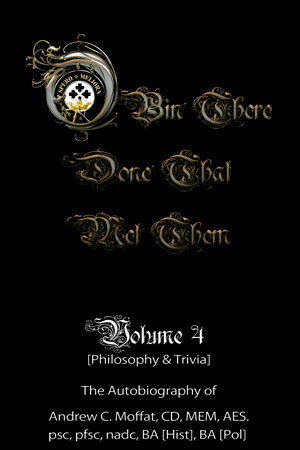 This Volume is Philosophy and Trivia. In this Volume I have tried to paint a broader picture of who I was and who I am. It will take all four Volumes to know me. I have enjoyed going back over my life — and I do think I have been remarkably honest and open. Baring the soul can often cause blood and tears to flow. You may see many stains on these pages. Our children don’t know what Canadians have done in the past — what magnificent contributions, out of all proportion to our population — we have made to the world! Our schools teach our children how to make use of the Social System — but not how to screw in a light bulb! For much of our current population to “think outside of the box” is a frightening suggestion — it may be illegal! — neighbours may think I am going out of my mind! — I’ll be embarrassed if things go wrong! How sad… even how pitiful we are becoming!